Movie News Release is the unusual subject matter of the episode we deliver today. I don’t think that I have ever released a show like this before, but there is a reason for bringing it to the world. You see through running a show like Join Up Dots for the last five years,we have have been focused on inspiring the world to take action. To realise that a life of your dreams starts with a simple starting action. Everything starts with a vision and then a lot of hard work. In today’s episode we show the first episode of Movie News Release a new podcast produced and hosted by my son. This is hugely exciting for me as my son is working hard to break into the world of media, so this is his first step. Why Did Movie News Release Come To The World? My son is studying media at college and through his studies needed to create a podcast. He also needed a co-host to run the show with him. So who did he choose to perform this vitally important role? Well he chose the host of Join Up Dots to join him. 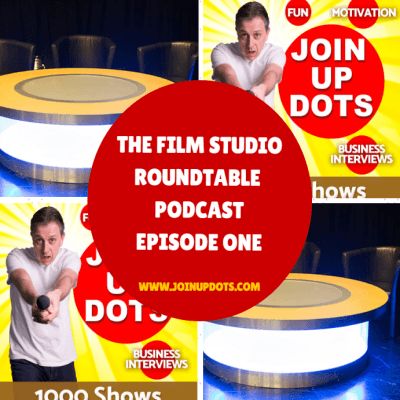 The remit of the podcast was to create an engaging, free flowing podcast…ranty, opinionated and non-scripted. Therefore without any planning at all, we pressed record and saw what came out of the recording. That is what life is about after all. You prepare, press record, and then do your very best with what happens. Sometimes you get a chance to go back and polish things up. More often than not you don’t, and have to make decisions how to get things back on track. Could We Have Done Things Differently With Movie News Release? Yes of course we could. We could have spent hours preparing a detailed script. Even bringing in sound effects and movie clips into the mix. However would it have been any better in the long run? Would it have been restricted by the desire for perfection, instead of just taking the action. Probably not…its job done as good as it gets. Get it out to the world and move onto the next piece of action taking. Enjoy Movie News Release as this isn’t going to appear again.